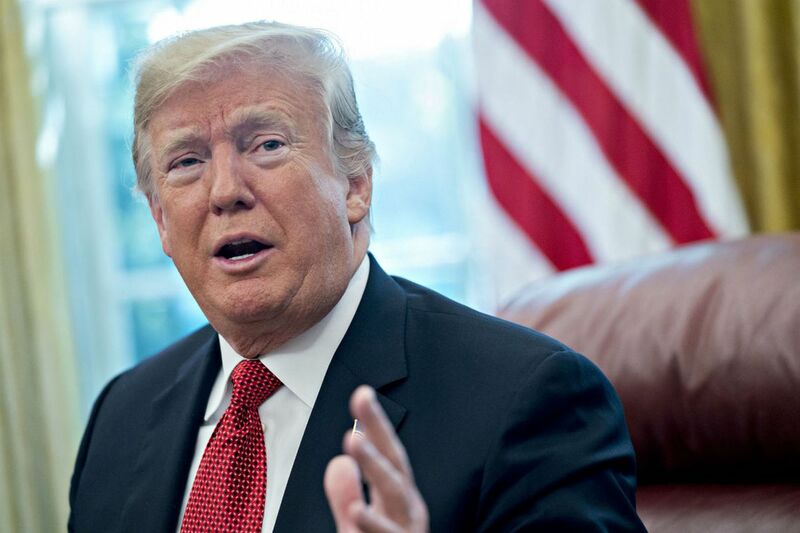 WASHINGTON – Behind President Donald Trump's talk of an imminent middle-class tax cut, his advisers are holding discussions on a far more modest proposal to ask Congress to eventually hold a symbolic vote promising a tax cut in the future. Advisers have discussed the idea of having Congress vote on a symbolic "resolution" for a future 10 percent tax cut for the middle class, people familiar with discussions said, part of their scramble to meet Trump's demand for rapid action to blunt Democrats' economic messaging ahead of the midterm elections. The resolution would not be binding but would attempt to send a signal to the public that Republicans are focused on helping middle-class families. Even if approved, the symbolic resolution would not deliver the lower taxes Trump promised Monday night in Houston. "We're going to be putting in a 10 percent tax cut for middle-income families," Trump said at a rally with Sen. Ted Cruz, R-Texas. "It's going to be put in next week, 10 percent tax cut." At other times Trump has suggested Congress might do something closer to the non-binding resolution that White House officials are discussing. "We're putting in a resolution in the next week, or week and a half, two weeks," he told reporters Monday before departing for the Texas rally. White House officials have not reached a final decision on how to proceed, and it's possible Trump could force lawmakers to pursue something more concrete. Right now, a number of senior aides are trying to either deflect questions or walk back suggestions that an announcement is imminent. "Right now, the person who's discussing the 10-percent tax cut for the White House is the President, and so you should go to the press office and to the President if you want more information on that," White House Council of Economic Advisers Chairman Kevin Hassett told reporters Tuesday. Passing tax bills through Congress is very difficult, however, and could revive a debate about whether lawmakers went too far in cutting taxes for businesses last year. The House and Senate are out of town and not slated to return before the midterm elections in early November. Without returning, they could not hold a vote next week on legislation to cut taxes or on a symbolic "resolution" to cut them in the future. White House officials have discussed in recent days the possibility of working with GOP leaders in Congress to introduce the symbolic resolution as soon as next week. In a statement Tuesday, House Ways and Means Chairman Kevin Brady, R-Texas, said: "We will continue to work with the White House and Treasury over the coming weeks to develop an additional 10 percent tax cut focused specifically on middle-class families and workers, to be advanced as Republicans retain the House and Senate." The White House and many Republicans said the massive tax cut law they passed last year would ensure a big win in the midterm elections, but polling has found the law is unpopular with many voters because it delivered the biggest long-term benefits to companies and upper-income Americans. There are also growing signs Trump is seeking to change the White House's economic message at a time when the stock market has tumbled sharply. The resolution idea has caught Trump's attention in recent days, although White House officials haven't committed to pursuing that specific approach. Trump mentioned the idea to reporters Monday, although it was unclear at the time whether he was referring to an act of legislation or a nonbinding measure. Trump has urged GOP leaders for months to consider additional ways to cut taxes, and the House has passed a bill that would make permanent several temporary tax cuts in last year's law. The Senate has so far not acted on that legislation. Key details of an eventual tax plan remain under review, but Trump on Monday said the goal is to lower the tax burden for the middle class by 10 percent – not to lower the taxes of businesses. He also said he had been working on the plan for months with Brady, although lawmakers have largely tried to direct any questions about new proposals back to Trump. If the White House were to define the middle class as any household earning less than $200,000, a 10 percent tax cut would cut would lower taxes by roughly $61 billion a year, according to Internal Revenue Service data. That could also mean adding more than $600 billion to the deficit over 10 years – unless Republicans found other tax raises or spending cuts to pay for it. The new tax law they passed in 2017 did not contain such offsets, and nonpartisan analyses project it will add more than $1 trillion to the deficit over the next decade. White House National Economic Council Director Larry Kudlow said Trump's new idea is "in the planning stage" and shows how the president is always pushing for taxes to be lowered. "He's a tax cutter," Kudlow told Fox News on Tuesday. "We are going to try to work out some of the details on his proposal for a 10 percent middle-class tax cut." "They are just sensitive to the Democratic attack that the rich benefited from the first tax cut" more than the middle class, said Stephen Moore, who was an economic adviser to Trump during the 2016 campaign. Moore said that such an approach might have made more sense if it were done weeks or months ago but that now it is too close to the midterm elections – and lawmakers won't even return to Washington until after the public votes on who will control Congress next year. He said Republicans should have spent more time in recent weeks talking about how their economic agenda was helping the middle class. "It's a messaging problem for Republicans," Moore said. "They are just poor at selling their own agenda." In June, a Monmouth poll found 34 percent of respondents supported the tax cut law, and 41 percent opposed the law. At the heart of the Democrats' health-care message is an attempt to win back middle-class voters, many of whom abandoned the party to support Trump in 2016. And some Democrats are crafting their own plans to cut taxes for the middle class, ideas they began promoting before Trump mentioned his initiative several days ago. Sen. Kamala Harris, D-Calif., who is considered a potential presidential candidate in 2020, this month advanced a plan that would extend $500 monthly tax credits to working families who earn less than $100,000 a year. Other Democrats are attacking Trump's new tax cut pitch as a last-minute attempt to try to rebrand last year's huge tax cut, which some Democrats have pledged to try to undo in part if they take power. "This empty rhetoric is an admission by Donald Trump that his tax law only helps corporations and the donor class," said Sen. Ron Wyden of Oregon, the top Democrat on the Senate Finance Committee. "The middle class will see straight through this scam just like they did with Trump's broken promise to deliver $4,000 wage increases."